So what do I gain by grinding the salt at the table or at the stove instead of just buying the smaller version to begin with? I understand that there are different kinds of salt, but it seems they ought to be independent of the size of the bits. Trying to get to the bottom of the issue, I decided to take a few pictures of a few different types of salt. The pictures shown below were taken by me and are all proportional (the camera was the same distance away from each type of salt, so you are getting an accurate size comparison). The picture illustrates my suspicions, which is the difference is the surface area (ignoring of course mineral content and different types of grinding salt). Standard table salt is a compact little cube, effective when it’s to be dissolved in a liquid, but not so much when it comes to direct contact with the taste buds. Place one cube on your tongue and you get 1/6th of the surface area in contact, meaning, a lot of salt without much saltiness. Sea salt, with a more rectangular shape is closer to 1/4th the surface area touching your tongue. 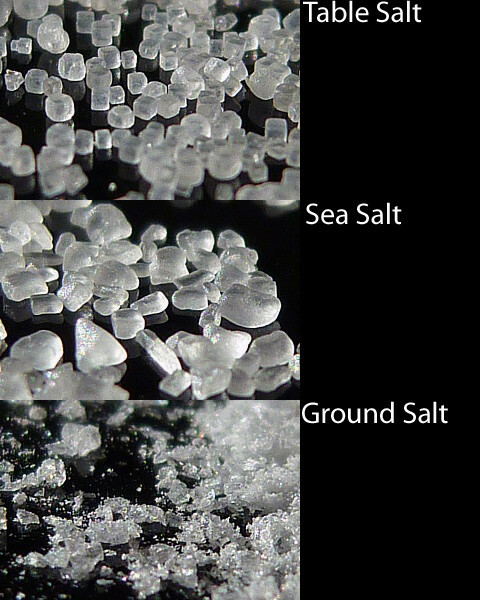 Ground salt is more like shards of glass, so nearly half of the exposed area could be in contact making things taste that much more salty. Also with a much finer texture, you are left with many more particles in a wider area, meaning, a saltier taste with less salt. It’s a good way of finishing a dish when the salt is going to be lightly dusted on top or mixed with an oil where it will not dissolve at all. When you are dissolving it in a liquid, it really makes little difference which type you use. When it comes down to it, it’s all about how picky you want to be with it. You'll use less. At least applied at the table, salt is a flavoring which only does it's work at the interface between tongue and food. You don't need a lot, just enough to coat the surface and facilitate the flavor transport. Kind of like grating cheese rather than just blanketing a dish with it. Sometimes less is enough, and smaller flakes of salt would qualify. Smaller flakes also reduce the risk of oversalting or hitting salty spots in which large crystals of salt haven't broken down. Some grinders have an adjustable size output. I was given a pair of pepper and salt grinders. I initially thought, hmm, isn't the salt usually not a grinder. The one I have does make sense though, because its grinding size can be adjusted (there is a little knob in the middle of the grinder that tightens or loosens the area in which the crystals come out. So the container is full of larger sized sea salt, larger then you would ever sprinkle over any dish, almost like little rock candy (in appearance, not taste of course) and depending on what I am doing with it, I can control the size. Normally I just use my box of Kosher salt, but at least I have the option of various sized sea salt without having to keep a bunch of different containers of it. I suspect it's just marketing. I don't think there is much point unless you need to grind rock salt. If you need a fine grained salt, buy table salt or a fine sea salt. If you want coarser grain use a kosher salt or a coarse sea salt. I keep my kosher salt in a salt cellar similar to this one. When cooking it's convenient to just open and grab a pinch, or dip a measuring spoon in. I don't provide salt shakers at my dinner table for guest use either. You'll use less - it takes more effort to grind salt than it does to simply shake it onto your food. Larger crystals absorb less moisture. But may be kinda lumpy for the palate. Also, 'culinary' salts (made by nature, with different trace elements) are naturally larger. Can you really taste the difference? I think I can. This is a bit of a stretch. Surface area. If you are buying the sea salts that have large crystals you can just sprinkle them over the food. However, grinding them adds surface area to the salt and enhances flavor more effectively. You don't have this surface area problem with finely ground table salt. You can tell the difference between "normal" finely ground table salt and many salt packets at take-out restaurants that are very finely ground. Again, surface area. There is no use for a salt mill. It has a lot of myths surrounding it, but at the end of the day it's merely more "trendy" than a regular salt dispenser. All the ones I've tried grind the salt much worse than expected, leading to actually using more salt, or disgusting salt chunks. When cooking, it's merely annoying, since the salt dissolves anyways. There's no point to it - salt is a rock, ultimately. It's a cute affectation but otherwise serves no considerable culinary purpose. A mill or mortar allows you to use salt without any of the additives that most pre-ground table salt has to keep it from slowly turning back into a large solid piece. Also, if the mill allows you to get a coarser or finer grind, it is useful - very fine salt eg is very helpful if you want to make real fast-foodish french fries (since the fine salt will actually cling to them and get very quickly dissolved and noticed in the mouth). Symmetry with the pepper mill? Otherwise it isn't too bad a way for you to dispense salt without putting on too much. It's not just marketing. It really does make a difference in the flavor. It's simply common courtesy to place salt and pepper on the dining table. Not everyone reacts the same way to the amount of seasoning in food. I often want more salt than my host has used to season a dish. Older people especially often need to use more salt as the sensitivity of their taste buds declines. Men often don't have as acute a sense of smell as women and may want more salt. Unless you are using a completely air and moisture tight container, which you may be, small salt particles attract moisture from the air and stick together. In order to combat this in regular salt shakers people often use rice, which is strange and icky and barely actually works. Dispensing salt out of, say, a prepara evak container, since that is about the only moistureless airless container I know of that is convenient to use for dry ingredients, is extremely inefficient, and is just asking to accidentally over-salt your food. As a matter of fact, most standard salt shakers will also over salt your food if you are not careful. A salt grinder serves several purposes. Using larger pieces of salt, while they still attract moisture, they are not clumped together in the same way, and are broken into smaller pieces only as need be. Also the inside of most salt grinders, while far from airtight on most models, is at least not letting in a lot of air, and is generally a good place to keep your salt, because, let's face it, you have to keep it somewhere. Also, it's aesthetically pleasing, it's alchemical, and fun, and when it comes to food and cooking, these things are important. Not the answer you're looking for? Browse other questions tagged equipment salt or ask your own question.